The Stanton Chase Moscow office recently supported the 17th meeting of the Directors Discussion Club (DDC), a prestigious group of area leaders who meet to discuss current topics and unique issues in the marketplace. 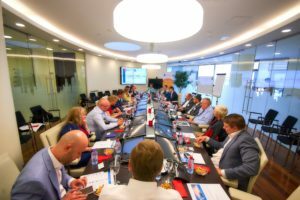 The meeting took place in the very heart of the city at the offices of the Moscow Exchange on June 7, 2018. The Directors Discussion Club (DDC) was founded in 2013 by Andrei Rakitin, Managing Partner of Stanton Chase Russia, Elena Tarasenko, Founder and CEO of Turner Group, and Mikhail Kuznetsov, Founder and CEO of TopCompetence. Since its inception, the DDC is a platform for business owners, board members, CEOs and niche experts for discussing current issues and sharing experiences with each other. · What attracts seasoned directors and senior executives to their hobbies? · Who else benefits from them? · How do their hobbies influence society and the environment? · Can a hobby become a parallel career? The DDC holds meetings three times a year. Based on the discussion theme, founders carefully select up to 25 participants for each meeting. Over the course of five years, the DDC founders have enjoyed the company of more than 250 club members.